For those who need a little more space, the 20 X 25 wooden Classic Double Carport + Shed is the perfect choice! 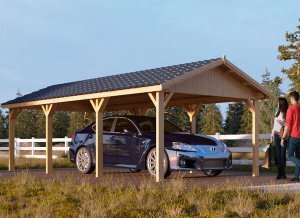 Enjoy the protected area for two cars (or something larger) with the addition of a shed. 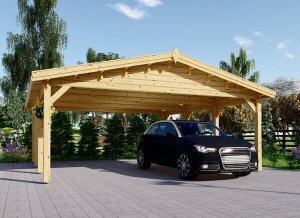 Save your vehicles from the rain and snow as well as the damaging hot sun with the use of this wooden double carport. You’ll also love the shed space to store your car essentials, garden tools or use as a small summerhouse. Created with slow-growing, high-quality timber, the 20 x 25 wooden double carport and shed comes with a 7-year anti-rot guarantee. Protected from slumping and sagging by three strong roof vaults you can be sure of security and longevity. The shed walls can be swapped at opposite sides to get just the look you want. Strong tongue and groove floorboards and double-glazed windows and doors ensure insulation where you need it most. It’s an impressive and functional outdoor delight. External dimensions (width x depth) 19'8" x 24'7"
Internal dimensions (width x depth) 18'8" x 23'7"
Door (width x height) 2'9" x 6'4"
Windows (width x height) 4'6" x 3'4" and 2'4" x 3'4"